Chicago, Illinois – Driving clinical and operational improvements and enhancing electronic medical record (EMR) functionality will be the focus of health information technology (HIT) investments in 2015, according to the results of a new healthcare leadership survey released today by Royal Philips (NYSE: PHG AEX: PHIA). These investments are focused on direct patient care and supporting collaboration across the care continuum, resulting in financial improvements – another key initiative behind HIT spend. Conducted by HIMSS Media on behalf of Philips and announced at the 2015 Annual HIMSS Conference and Exhibition, the survey of 121 healthcare IT leaders sought to determine how health leaders are currently prioritizing technology investment and adoption to address reform initiatives. Of the 121 respondents, 88 percent represent either standalone hospitals or integrated delivery networks (IDNs). More than 40 percent are in C-level positions, with the predominant position being CIO, and another 33 percent was comprised of IT directors and managers. As hospitals and IDNs adjust priorities to address the shift from volume to value, they are looking for new ways to support care and address patient needs. This has driven investment in new technologies to enhance the value of existing systems (73 percent), as well as new strategies to expand access to quality care anywhere and at any time. 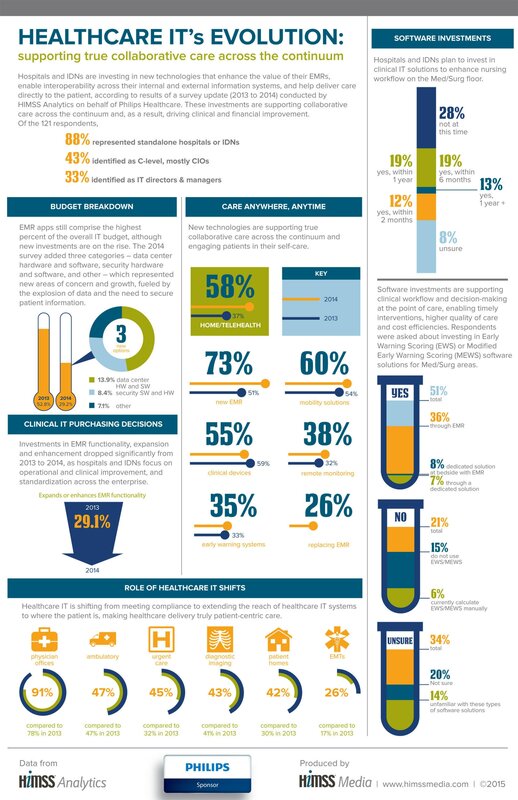 The majority of investment went into enhancing existing EMRs with new capabilities or modules, while deploying mobile solutions (60 percent), utilizing telehealth technologies (58 percent), and leveraging remote monitoring (38 percent) also saw growth in investment from last year. When it comes to the specific medical device IT trends and requirements that are most critical to new purchase considerations, respondents ranked patient health information security as most important (26 percent), followed closely by acceptance of new technology adoption by clinical users (24 percent), and technology to optimize reimbursement through Meaningful Use (22 percent). The most popular external IT deployments include: physician offices (91 percent), ambulatory surgery centers (47 percent), urgent care centers (45 percent), diagnostic imaging centers (43 percent), patient homes (42 percent) and EMT services (26 percent). More than half of survey respondents plan to invest in EWS/MEWS technology that provides monitoring of vital signs, allowing earlier deterioration detection and intervention. Though some respondents indicated they will use EWS/MEWS software solutions in the medical/surgical areas from their EMR, 15 percent of respondents said they will use a dedicated independent solution or a solution that compliments the EMR at the bedside. Six percent reported calculating EMS/MEWS manually, while 15 percent do not use EWS/MEWS at all. Of the 34 percent of respondents who said they are unsure about future EWS/MEWS investment, 14 percent are unfamiliar with alarm management software solutions. For more information on Philips’ presence at HIMSS, including the full suite of Philips interoperable software, solutions and services, stop by the Philips booth (#931), visit www.philips.com/HIMSS and follow the #HIMSS15 conversation @PhilipsHealth.